The Board of Standards & Appeals formally handed opponents of highrises in the South Slope a major victory yesterday by denying developer Isaac Katan's application to build an 11-story tower at 182 15th Street under old zoning regulations that allowed highrises like the one pictured above. 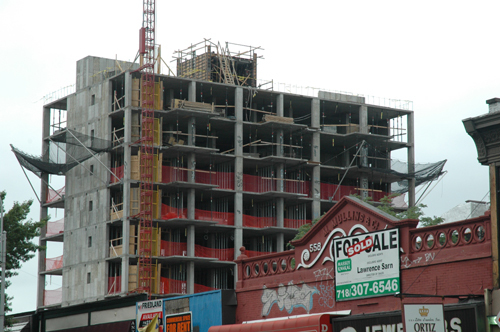 Parts of the South Slope, Greenwood Heights and Windsor Terrace were downzoned last year, but developers have been trying ever since to get a number of buildings "vested" under the old zoning. (The legal issue hinges on how complete a building's foundation was at the time the zoning was changed.) The BSA ruling can be appealed to the State Supreme Court, but it doesn't often overturn BSA decisions. The 15th Street building was the subject of a particularly nasty fight between neighborhood groups and the developer. Aaron Brashear of Concerned Citizens of Greenwood Hts., which has helped lead the fight against the highrises, said residents "are most encouraged that BSA took seriously the community's allegations of illegal and improper practices" at the building site. The agency gave developers the go-ahead in three previous cases. Three remaining properties--at 614 7th Ave., 1638 Eighth Ave. and 422 Prospect Ave.--are still up for BSA decisions.